These mini pot pies seem grown up, but are as simple as spooning the filling into bowls and blanketing with dough. 1. PREHEAT oven to 400ºF. Measure all ingredients. 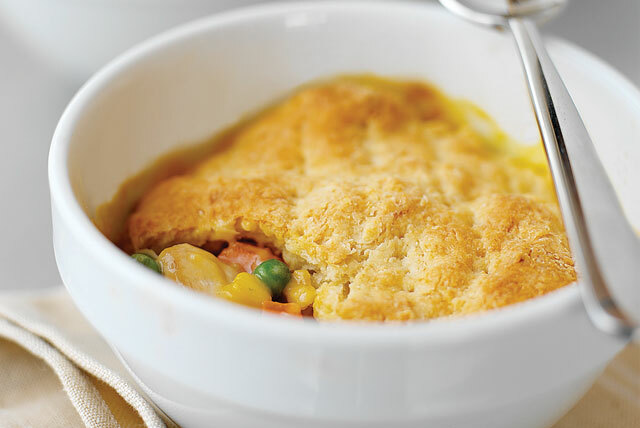 Mix vegetables, chicken and soup in medium bowl; spoon evenly into 4 (2-cup) ovenproof bowls. (Most cereal bowls are suitable.) Top with shredded cheese. 2. MIX flour and baking powder in medium bowl. Cut in cream cheese spread with pastry blender or fork until mixture resembles coarse (pea-sized) crumbs. 3. STIR in milk with fork just until dry ingredients are moistened. 4. DIVIDE dough into 4 balls. Pat out dough into 5-inch circles on lightly floured surface. Prick tops several time with fork to allow steam to escape. 5. PLACE dough on top of chicken mixture. 6. BAKE 25 to 30 min. or until crust is golden brown. Makes 4 servings, 1 pot pie each.